How to Improve Your Self Esteem - Now! How to Improve Your Self Esteem – Now! In this post, we will talk about amazing tips from Lori Streator, about How to Improve Your Self Esteem, such an important topic. Are you afraid to take action in your life because you are holding onto fear? Are you feeling stuck? Are you holding yourself back from who-knows-what? When we don’t take action and pursue our dreams or goals, its more often than not because we don’t value ourselves enough to do so. We don’t think highly enough of ourselves & our abilities to take that proverbial leap. For whatever reason, you may have fueled your life with a negative, limiting mindset. 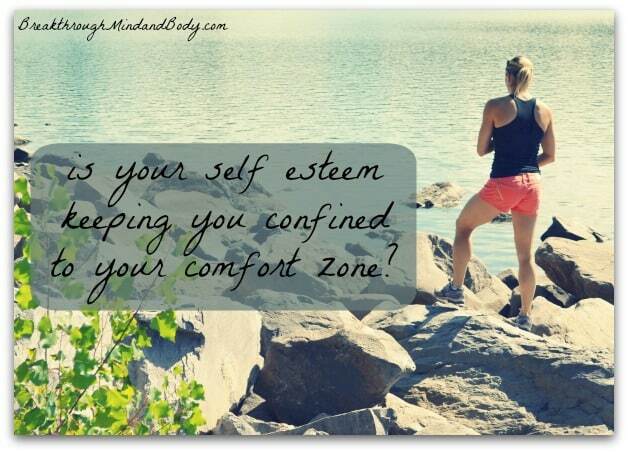 And now your lack of self esteem is holding you hostage in your Comfort Zone. A major challenge of improving self-esteem is having to acknowledge and focus on changing the negative behaviors that fuel negative thoughts. You stay home instead of going to the gym. Because home is where you feel safe. But this avoidant behavior doesn’t provide any opportunity for growth or change. Instead, it keeps you in the same mindset and lets you begin to think that avoiding your fears completely is an effective coping skill. When you decide to make changes because you’re tired of feeling stuck inside your own mind or you realize your current mindset isn’t serving you, you can make small changes that will begin to improve your self-esteem. What we focus on, expands. The more you dwell on a problem or insecurity, the stronger the thoughts surrounding it become. In order to improve your self-esteem, you have to shift your mindset and you’ll begin to re-wire your thoughts. 3 Thoughts That Will Keep You Stuck… and how to shift your mindset to improve your self-esteem right now! The only thing we have 100% control of is our thoughts. Constant fear of the future or what may happen will keep you held back from opportunity and ultimately fulfilling your potential as a human being. If you wake up every day with fear or negative thoughts in your head, your day is not likely to be positive. 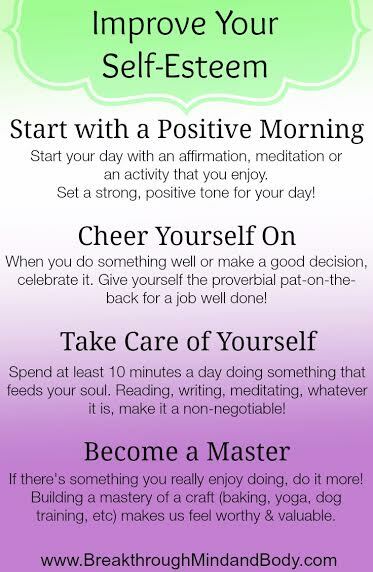 Starting your day with meditation, affirmations or an activity you enjoy will help set the tone & start your day off on a strong, positive note. This is a negative thought I see with clients that often stems from childhood experiences. Working with someone to help identify the source can be helpful, but there are ways to begin changing this thought once you are aware of it. Make a list of at least 20 things you are good at. Baking, parenthood, writing, taking photographs, etc. Enlisting the help of a friend or loved one can be reassuring during this process. You can return to this list any time you’re struggling, because acknowledging what you’re good at allows you to focus your energy on something fulfilling. However, connecting with others can be one of the most powerful things you can do in your external life. Make a list of reliable people in your life and focus on those who support you & help provide you with positive interactions. Connect & interact with them as frequently as possible. Fuel those relationships and let their radiant energy feed your soul & self esteem. Volunteering is also something that allows us to feel needed, helpful & see our value in the world. Giving back can be the ultimate challenge, especially when we’re struggling in our own lives, but volunteering helps to put life into perspective. So whether you’re living in a constant state of anticipation, feeling unworthy or fearing rejection, you can shift your mindset to a more positive place. Using the tips in this post on how to improve self-esteem, asking for help and more effective Self Talk can certainly help pave the way. It may take some time, but with the repetition of more appropriate thoughts & behaviors, you’ll begin to improve your self esteem & feel better about your life! Lori is the owner of Breakthrough Mind & Body, and lives life with energy & ease. She holds a clinical professional counseling license & fitness and nutrition certifications, and coaches people all over the globe. Lori teaches others to use fitness, nutrition & mindfulness to live the lives they desire! You can find her at http://breakthroughmindandbody.com/ and on Instagram @LoriSuperfoods.